OK… it’s getting to the point where I almost am afraid to go out into the garden; how many more zucchini and eight ball squashes (about the size of a bowling ball, not an eight ball by the way) and tomatoes will there be? I know I will be sad when they are all gone, but right now they just stare at me and yell WORK! Pick ME… figure out what to do with ME… NOW… before I get any bigger, or riper… NOW Lindy… NOW! 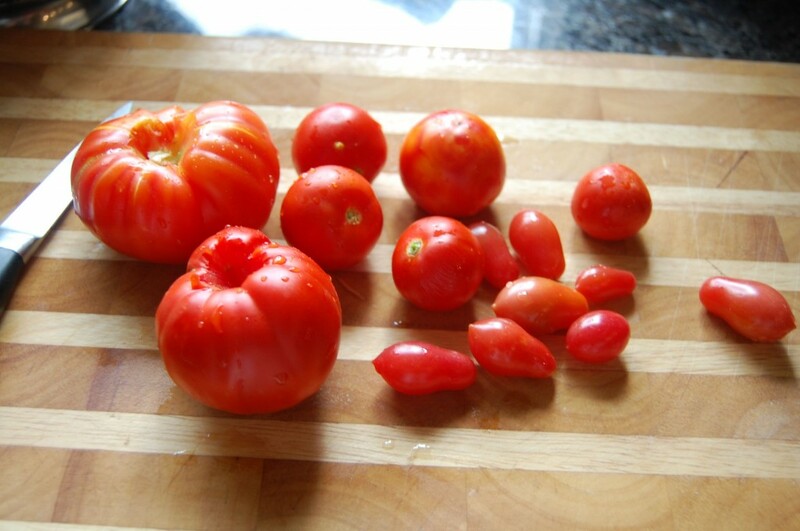 So, I showed them and I’ll show you how to make Homemade Tomato Sauce. 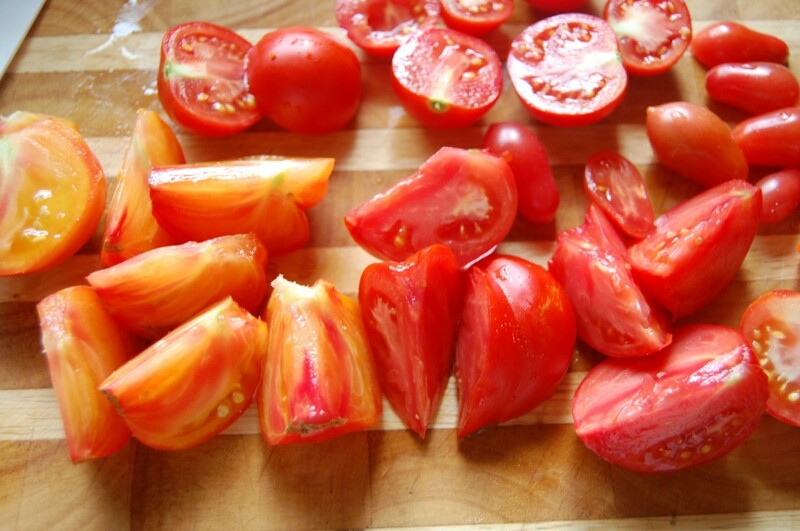 How to make Homemade Tomato Sauce – just like this! So there you are now, you little tomatoes you, all squished up and in the freezer waiting for winter when all that will be left resembling a tomato is those sad anemic things in the stores they call tomatoes, but we all know, they aren’t really tomatoes. If you don’t have a garden full of tomatoes right now…go to your local farmer’s market and buy some while they are in their prime. 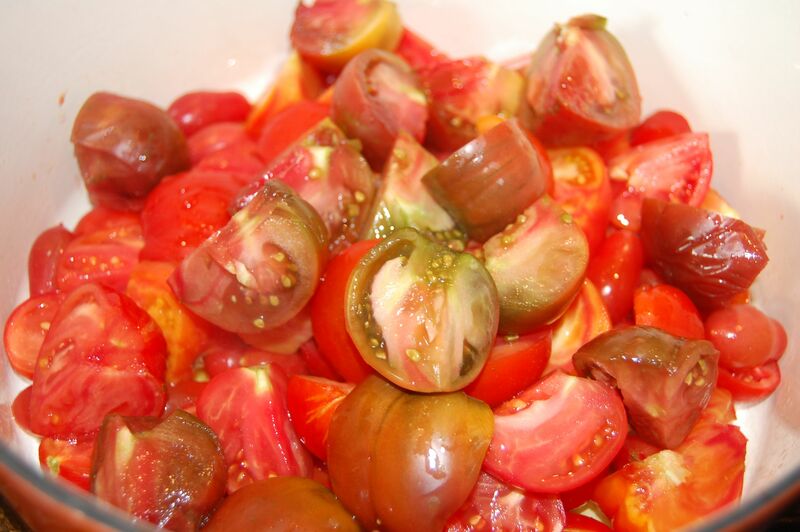 You don’t need to buy the best of the bunch, as a matter of fact, most of the farmer’s will have a few boxes of “not too pretty and too ripe to sell” tomatoes for the cheap. Just ask them. 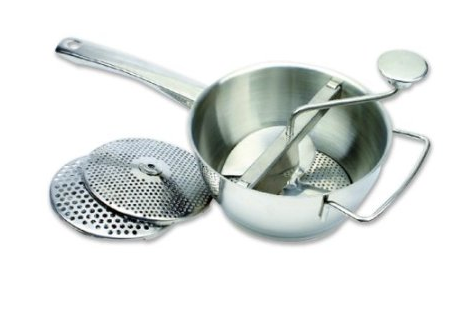 A non-reactive pot is one that doesn’t allow the acids from the food to react with the composition of the pot. This enameled 5-quart Dutch oven is a perfect choice. 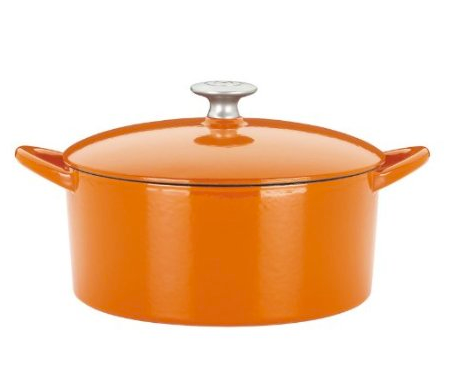 This one, is from Mario Batali, and is cheaper, but just as good as Le Creuset IMHO. 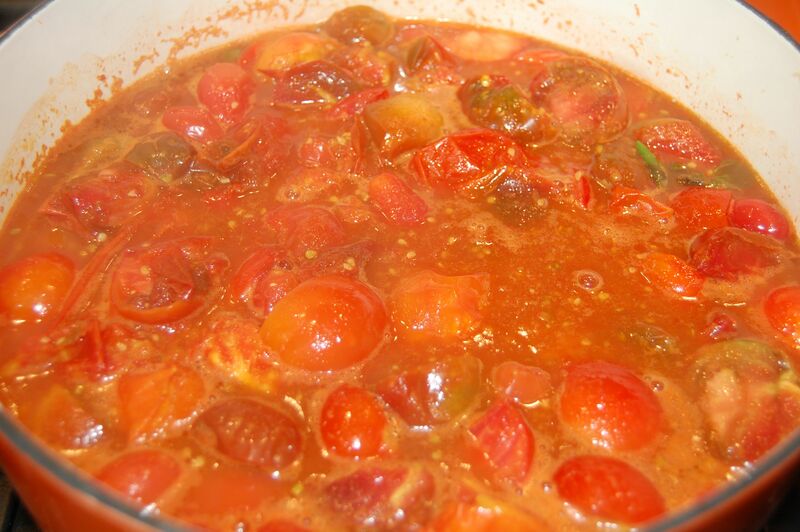 Pour a little extra virgin olive oil into the pot, put it over a medium heat, and start adding your tomatoes. You don’t need to wait for them all to be cut up before beginning to add them as they will break down from the bottom. You can also add just a pinch of salt; but don’t add too much. Remember LindySez you can always add, but it’s really hard to take out. Just keep them simmering, and stir every once in a while to bring the bottom to the top and the top to the bottom. Now that the tomatoes are nice and soft and have given up most of their juices, turn them off and let them cool just a bit, cause now we’re going to put them through a food mill…I use the middle medium fine disk, if you want to make sure there are no seeds in your sauce, you can use the smallest one, it just takes a bit more “elbow” grease to get the job done. Many food mills come with interchangeable disks. 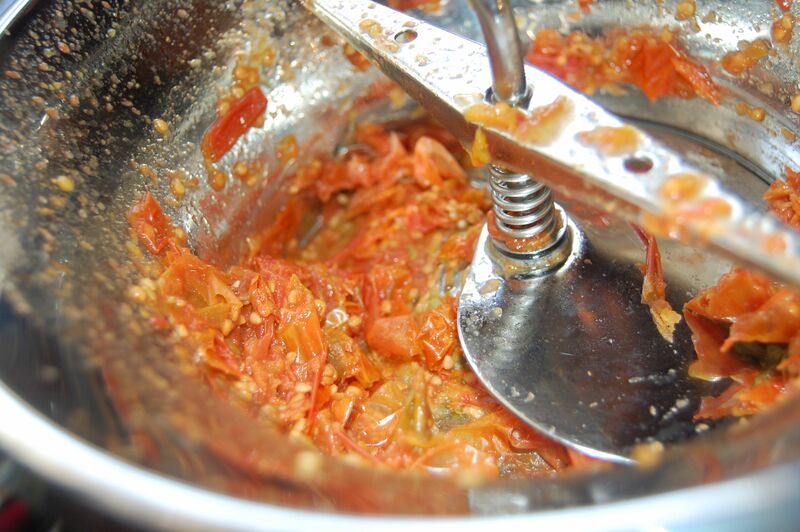 Set the mill over a bowl to for the sauce to go into and then…mill away the skin and seeds. You will be left with a beautiful heap of skins and seeds; great for composting into acid loving plants. If you don’t have a food mill, you can blend the tomatoes in your blender, use the puree mode. Once it’s a pretty fine liquid, force it though a fine mesh stainer to remove the skins and seeds. Now, return the puree to the pot, and over low heat, simmer for about 1 hour, to allow some of the water to evaporate. 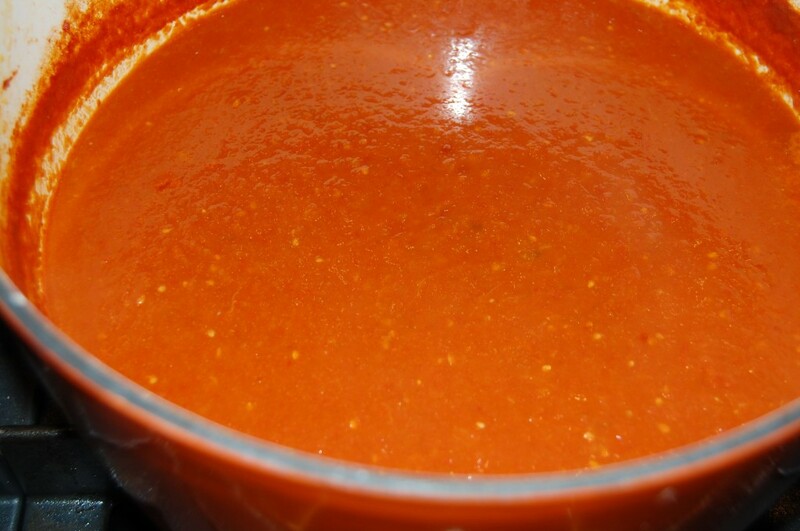 This will leave you with a rich tomato sauce. Hi Lindy, Aren’t tomatoes pretty? 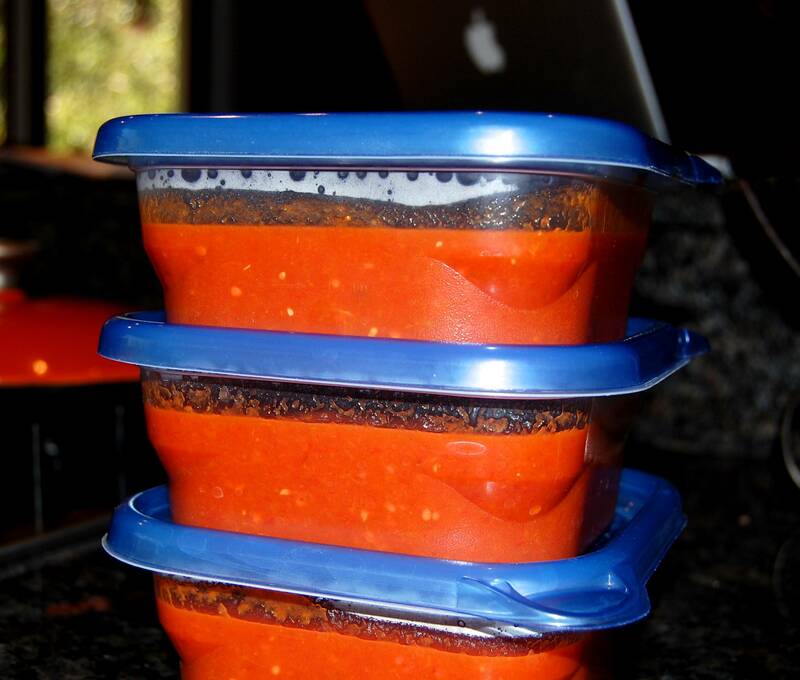 You have inspired me to make tomato sauce!!! Yes Linda, I love summer for the tomatoes, along with peaches and apricots and plums oh my! I miss them so when winter arrives.